Choose your own adventure! This post is filled with decisions... Fried or Baked? Caffeinated or Not? Doughnuts or Donuts? When the weather turns cool, I like to make donuts. At least that’s how I’ve settled on spelling it. As for fried or baked? Well, that’s a texture preference. Personally, I like the cake-like quality of a fried cider donut more so than the doughy-ness of a glazed. The caffeine question is a bit more mood related. Arbor Teas’ organic Masala Chai Black Tea has more prominent notes of spicy cardamom and a kick from black pepper, while the naturally caffeine free Organic Masala Chai Rooibos has a flavor profile distinct with warm ginger. Indecisive? The Organic Decaf Masala Chai Black Tea is yet another option that probably doesn’t help break any ties. 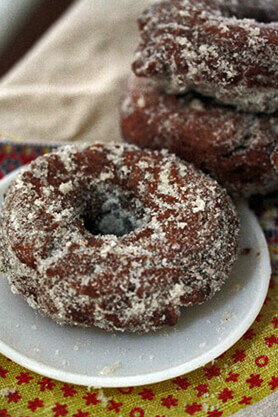 Here are two very different and customizable approaches to making chai-spiced donuts. Which do you prefer? To make masala chai-spiced, boiled apple cider for use in the recipe below, simmer 1½ cups apple cider with the chai tea in a small sauce pan. After 5 minutes or so remove the tea bag. Bring the cider to a strong boil and continue to cook, stirring frequently to prevent spill overs, until the liquid is syrup-like and reduced down to about ⅓ cup. This should take about 25 minutes. In a medium bowl, whisk together flour, salt, baking powder, baking soda, cinnamon, and cardamom and set aside. With a mixer fitted with the whisk attachment, beat together the sugar and butter until pale and fluffy, 4 to 6 minutes. Add the eggs, one at a time, beating for a minute after each. Next, add the buttermilk, chai-spiced boiled cider, and vanilla and mix well. The batter may look curdled at this stage. Fold in the flour mixture until mostly incorporated. A few lumps are OK, so don’t over mix. Line a baking sheet with parchment paper and dust with flour. Turn the dough out onto the baking sheet and gently pat flat to about ¾-inch-thickness. Dust the top of dough with additional flour, cover with plastic wrap and put in the freezer for 10 minutes to firm up a bit. Remove the dough from the freezer and use a lightly floured 3-inch donut or a cookie cutter to cut out about 18 donuts with holes. Gather any scraps and re-roll, chilling the dough again if needed to firm it up. Place cut donuts on another baking sheet lined with parchment paper, then transfer to the freezer for 5 minutes to firm up again. In a Dutch oven or large pot, heat about 3 inches of oil to 370° F degrees. Line a tray with several layers of paper towels. Slip 3 or 4 donuts at a time into the hot oil, being careful not to crowd the pan. Fry until deep golden on one side, about 1 minute, then flip and continue to fry about one minute more or until thoroughly cooked. Using a slotted serving spoon, transfer donuts to the paper-towel-lined tray. Continue frying the remaining dough (transferring to the freezer again for 10 minutes if you find it getting too soft as you work). For the topping, mix 1½ cups sugar with the spices. 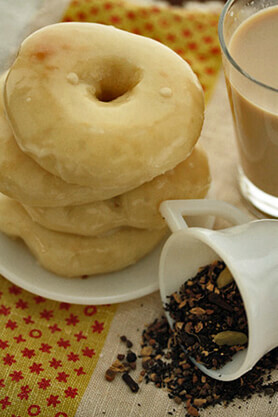 While still warm yet cool enough to handle, dip the donuts into the masala chai-sugar mixture. Eat immediately with a mug of warm cider steeped in masala chai tea! In a mixer fitted with the paddle attachment, beat the egg and sugar on medium speed until blended, about 1 minute. Add the milk, yeast, salt and vanilla, and stir until blended. With the machine on low speed, add 2 cups of flour, about ½ cup at a time, and mix until the dough is thick and pulls away from the sides of the bowl. Switch to the dough hook. With the machine on medium speed, add the butter one cube at a time, and continue to knead until no large chunks of butter are left in the bottom of the bowl, 3-5 minutes. Reduce speed to low and add the additional flour until the dough gathers around the hook and cleans the sides of the bowl. It will be soft and tacky, but not overly sticky. Turn the dough out onto a floured surface and knead gently until the dough no longer sticks to your hands. Lightly butter a large mixing bowl. Punch down the dough and roll out to ½-inch thick. With a 3-inch donut or a cookie cutter, cut out 10 to 14 donuts and holes. Preheat the oven to 400° F and line a baking sheet with parchment paper. Place the donuts at least 1 inch apart on the baking sheet. Cover with plastic wrap and let sit in a warm spot until nearly doubled in size, about 20 minutes. Bake until the donuts are light golden brown, 5 to 8 minutes. Meanwhile, make a chai tea latte for the glaze. Steep 2 teaspoons of masala chai tea in ⅓ cup of boiling water for about 5 minutes. Heat ⅔ cup milk until steaming. Combine the hot milk with the steeped tea. Next sift one cup of powdered sugar into a separate bowl. Add 3 tablespoons of the chai tea latte to the sugar and whisk until smooth. Dip the top side of each donut into the glaze and let drip on a wire rack set over a piece of parchment paper. Best eaten when still warm and along side an extra chai tea latte!